EventTrakker is designed to allow you to EASILY maintain your own events calendar without the use of a costly and always-busy webmaster. Create a dynamic site where users of your website can filter out the events they want to see! View a working demo. 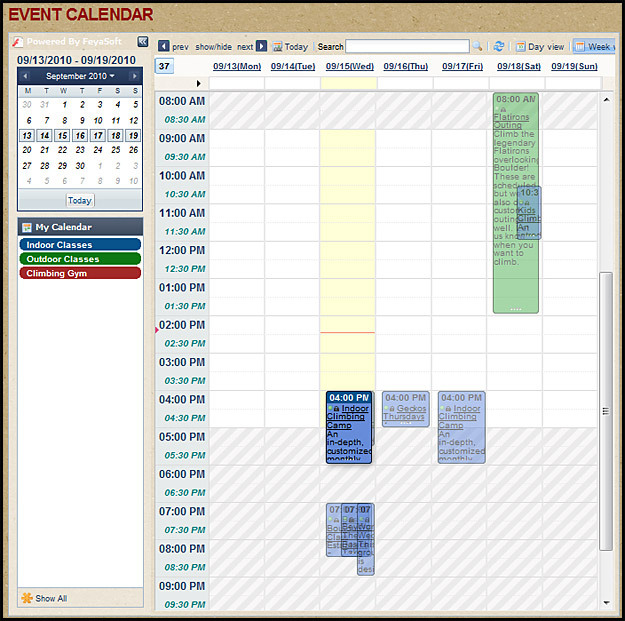 EventTrakker comes with a very powerful, fully-featured calendar. Not only will it do everything you expect from an online calendar such as schedule events and present them in day/week/month formats, it can also perform many advanced actions. 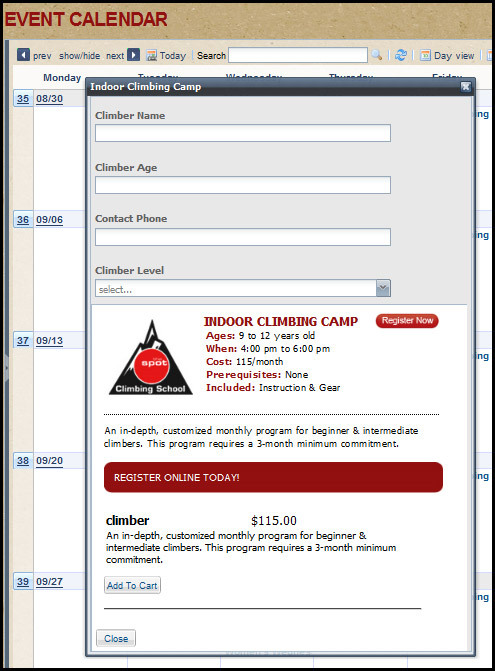 For example, we offer an add-on* to link the calendar to a shopping cart so your user can pay the registration fee for an event right from the calendar. You can even adjust some settings in Sitefinity. 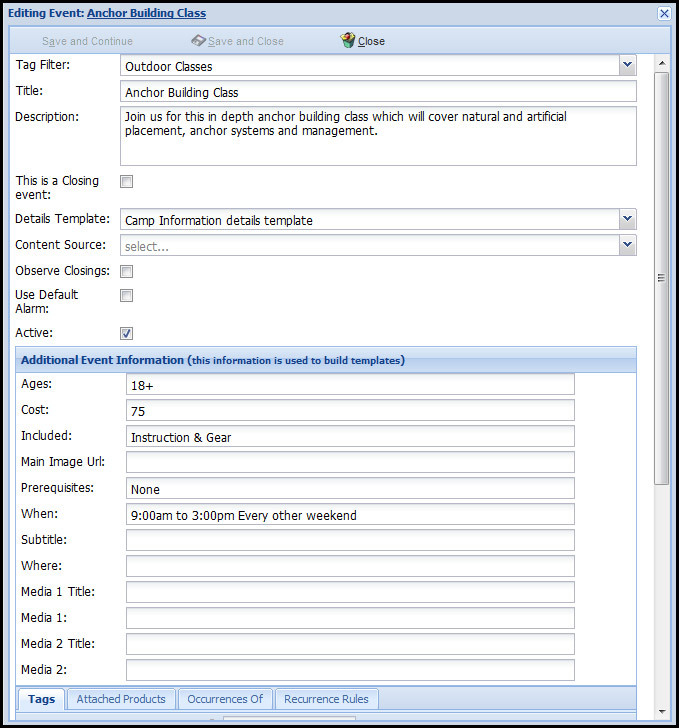 With EventTrakker you can allow users to view specific types of events with the use of filters. For example, the entire calendar can be broken up into high school events, lower school events, athletic events, evening performance events, etc. Take a look at some examples of the calendar to the right. 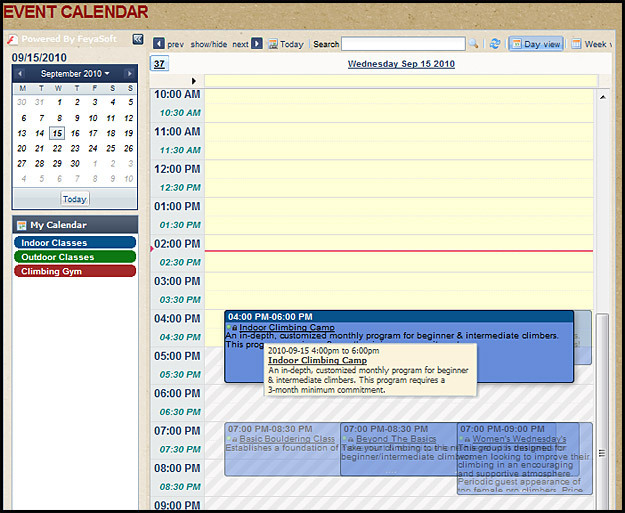 You can also view our calendar in action here. 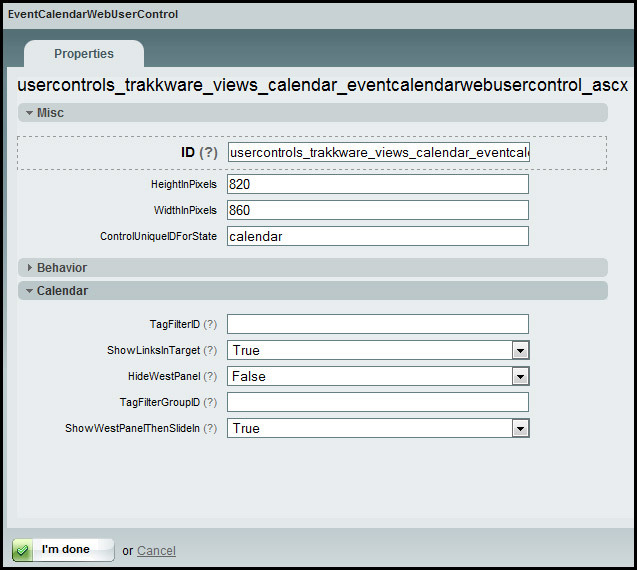 Create simple or complex events in the EventTrakker admin. 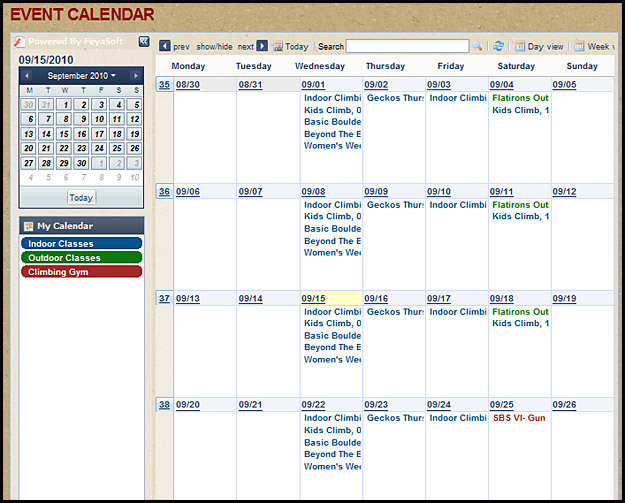 You can create a simple event such as a weekly meeting, a school football game, or a class. 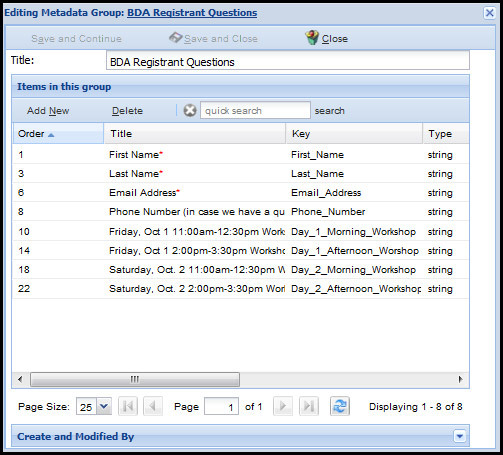 With the optional shopping cart add-on* you can also create more complex events that require registration forms, payment, products, and customized templates. 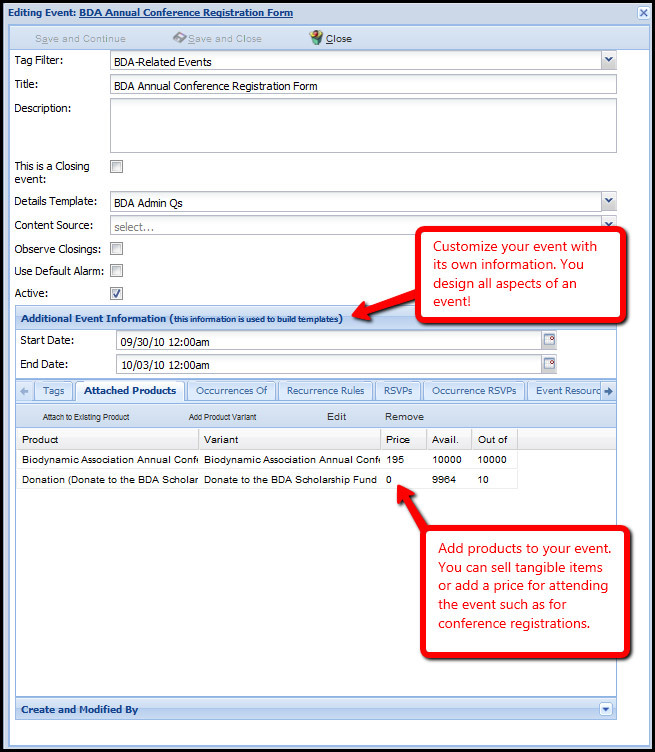 Click on any images to the left to view some of the options you will be able to control when creating an event. With the shopping cart add-on the power to build forms for your calendar products is in your hands. Use these forms for event or conference registration, for class sign ups, or to collect any information you may need from your users. All the information collected is stored securely. This makes e-commerce integration a breeze! Click on any image to the left to navigate through some sample Lightbox images. Your users will be able to see their items in a shopping cart on every page of the site. 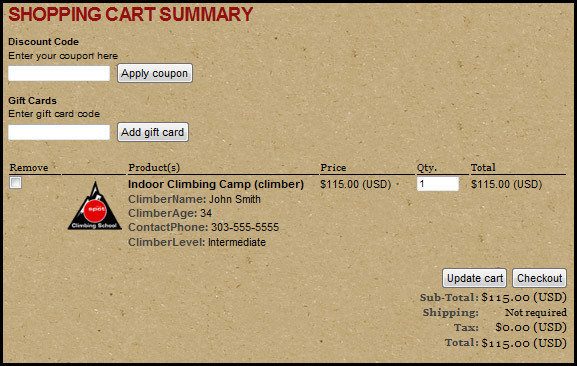 They can click on their shopping cart to view a custom designed cart summary and checkout page. 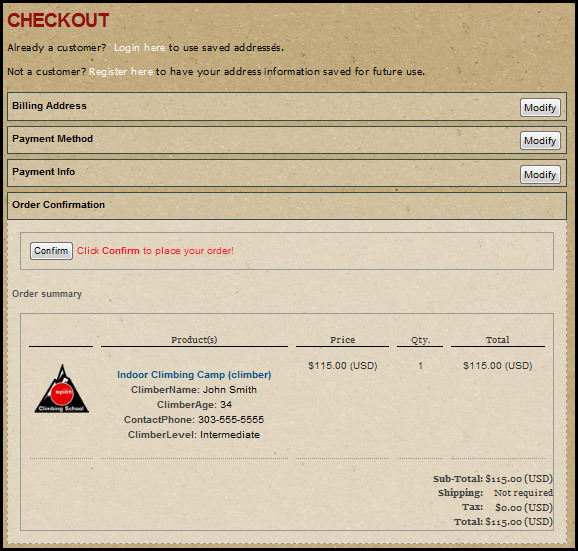 Our checkout process is incredibly easy to use and very secure. Click on any image to the left to navigate through some shopping cart images. *Shopping card add-on is optional and requires an additional charge. "How can we keep our online events up to date? We have a good web master, but he is often busy and it takes him a few days to update our events when we send him new events, plus all the old events are cluttering up the page." EventTrakker from Trakkware is designed to solve all these problems and more. 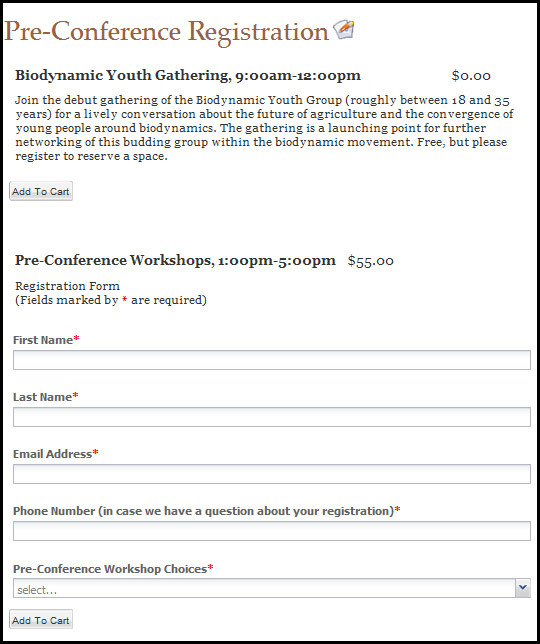 You manage your own events without the use of a web master. Simply log in to the admin console (generally found at http://events.yourschoolname.org/admin/) and maintain (add, edit or remove) events from your calendar. As events happen, EventTrakker automatically hides them from view. Visitors who want to see old events can do so by changing the dates that events are shown for. "We have various areas that all need their own calendar, such as the Lower School, the upper school, the athletics department. But how can someone see ALL the events in one place? We don't want soccer games cluttering up our parent meetings calendar, but parents don't want to have to look at 5 different calendars to figure out what's happening at the school."